Mitrastema yamamotoi is a natural monument of Kochi and is a representative plant of Muroto. This was first discovered in Kochi and Tomitarou Makino, a famous botanist from Kochi, described this plant as a new kind. 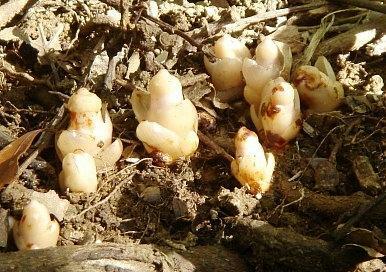 It is a parasitic plant of the Mitrastemon Yamamotoi family and is parasitic on the root of the tree of chinquapin. This is height 5~7cm, a cataphyll of several pairs of 1~2cm without the stem being big, and diverging. This plant does not make nourishment with oneself and gets nourishment by being parasitic on a tree of chinquapin. This is distributed from Shikoku to Okinawa. This has a hat, and some stamen become a pipe form. An anther clogged up with pollen on the side of the hat is belt-shaped. The flower is covered with the hat of the stamen at the beginning, but it fall before long, and a pistil comes out. A flower has a lot of sweet honey, and it is in the structure that honey collects on the root of the cataphyll in the bottom of the flower. When insects or small animals which demand the honey put a head to lick the honey, they touch the hat of one of a stamen and pollen attaches. And pollen attaches to a pistil and is pollinated when they move to a different flower and lick the honey in the same way. A natural enemy eating the main body of this is Japanese hare and treads down on the root of the chinquapin, and it becomes the harm to cut down a tree of chinquapin. As measures, it is surrounded with vinyl tape not to step. There is not the chlorophyl, and the whole is milky-white, but the part becomes the brown when tissue dies. The name is derived from resembling the figure which a crowd of guys parades around.